Home owners all agree that natural light “lights up one’s life.” The Alliance Vinyl Sliding Patio Doors do just that, with a statement of beauty and security. The Alliance vinyl patio doors was designed with maximum glass area to capture the light, while conquering the elements. 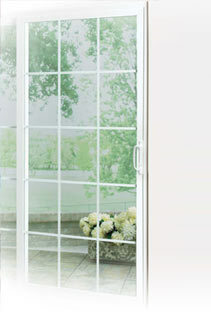 The Alliance vinyl patio door’s “easy touch” operation allows moveable panels to glide smoothly with minimum effort. The panels lock simply and securely with the highest quality hardware.